Nystatin is both fungistatic and fungicidal in vitro against a wide variety of yeasts and yeast-like fungi. Candida albicans demonstrates no significant resistance to nystatin in vitro on repeated subculture in increasing levels of nystatin; other Candida species become quite resistant. Generally, resistance does not develop in vivo. Nystatin acts by binding to sterols in the cell membrane of susceptible Candida species with a resultant change in membrane permeability allowing leakage of intra-cellular components. Nystatin exhibits no appreciable activity against bacteria, protozoa, or viruses. 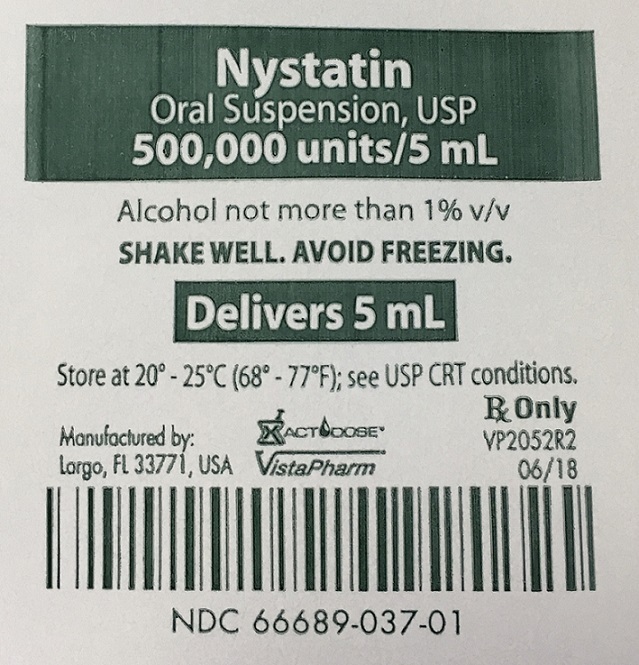 Nystatin Oral Suspension is indicated for the treatment of candidiasis in the oral cavity. Other: Tachycardia, broncho-spasm, facial swelling, and non-specific myalgia have also been rarely reported. Oral doses of nystatin in excess of five million units daily have caused nausea and gastrointestinal upset. There have been no reports of serious toxic effects of superinfections (see CLINICAL PHARMACOLOGY, Pharmacokinetics). INFANTS: 2 mL (200,000 units) four times daily (in infants and young children, use dropper to place one-half of dose in each side of mouth and avoid feeding for 5 to 10 minutes). CHILDREN AND ADULTS: 4-6 mL (400,000 to 600,000 units) four times daily (one-half of dose in each side of mouth). The preparation should be retained in the mouth as long as possible before swallowing. NDC 66689-037-01. 5 mL unit dose cup. NDC 66689-037-50. Case contains 50 unit dose cups of 5 mL (NDC 66689-037-01), packaged in 5 trays of 10 unit dose cups each. NDC 66689-037-99. Case contains 100 unit dose cups of 5 mL (NDC 66689-037-01), packaged in 10 trays of 10 unit dose cups each. Store at 20°–25°C (68°–77°F); see USP CRT conditions.